For about a year-and-a-half now, NASA's Juno probe has been orbiting Jupiter at a speed of about 130,000 miles an hour. As it orbits, the spacecraft examines the planet, from measuring how much water is present in Jupiter's atmosphere to the composition of the gas giant planet to mapping its gravitational fields, among other things. 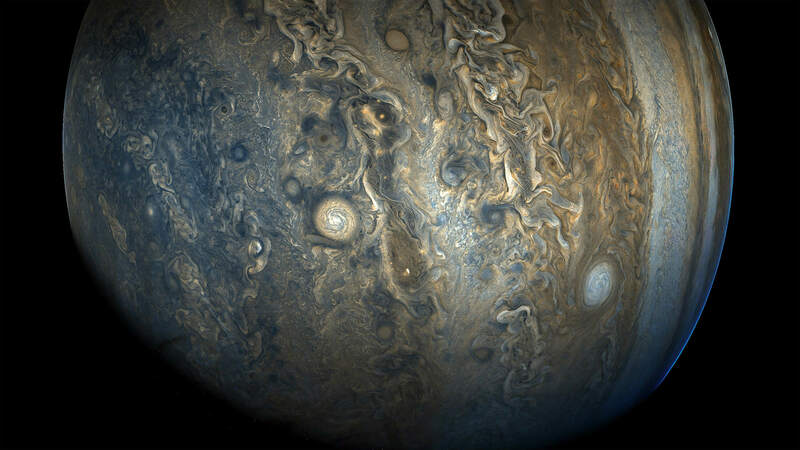 Juno is taking some pretty amazing photos, too. 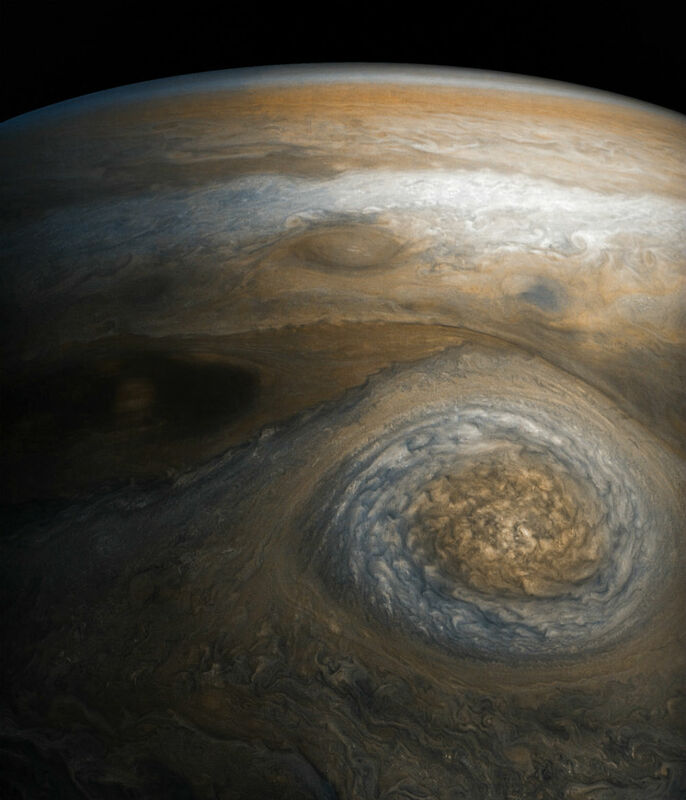 The featured image above, taken on October 24, 2017, shows the gorgeous detail of Jupiter's southern hemisphere, most notably, the large white oval - one of eight huge rotating storms on the planet referred to as the "String of Pearls." 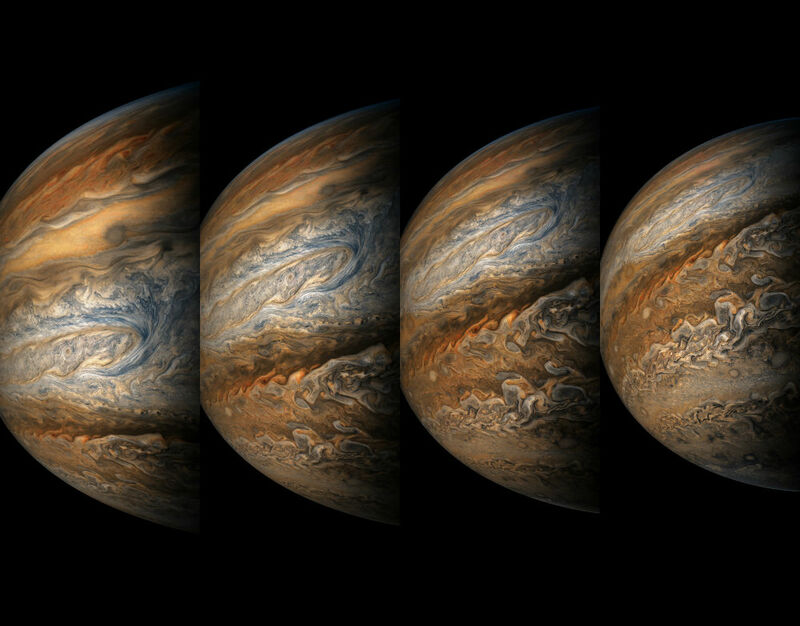 The latest batch of photos released by NASA - taken over the last year or so - might be some of the most breathtaking ever taken of Jupiter. The gases in the planet's atmosphere have been rendered yellow and blue to create a marble-like appearance. 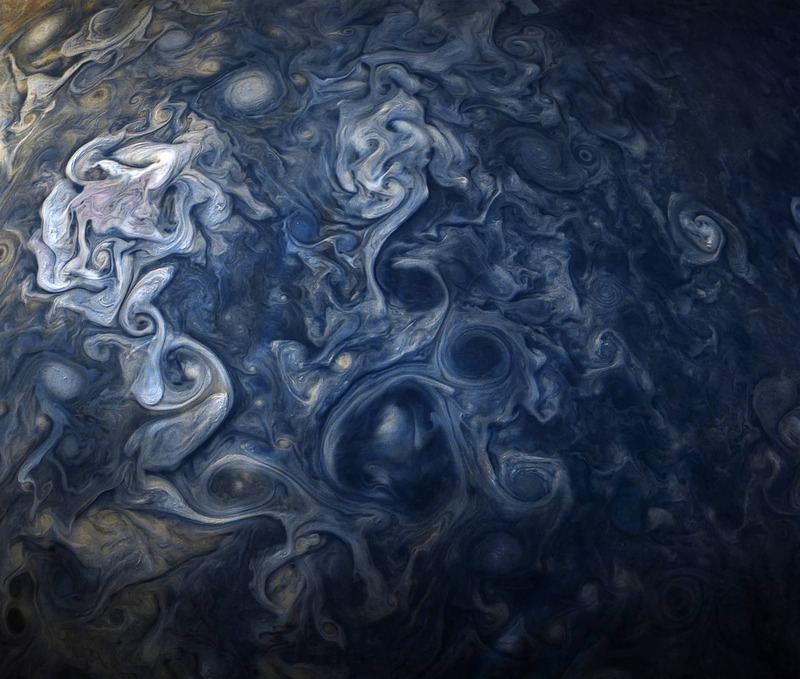 The photo above of Jovian clouds was taken from a relatively close distance of 11,747 miles above the clouds, which were churning in Jupiter's northern hemisphere. 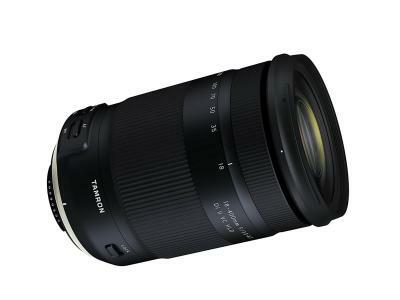 As a fun fact, each pixel in this image equals 7.75 miles. But even more impressive than the coloration is the swirling pattern of the planet's clouds. In the close-up image above, it doesn't even look like a storm ravaging the surface of Jupiter, but instead more like a watercolor painting. The storm shown in the image is rotating and has clouds at varying altitudes, which is why some appear darker (because they're closer to the planet's surface) and others appear lighter. The sun is entering the scene from the left, casting shadows from the clouds that extend anywhere from 4-8 miles in length. 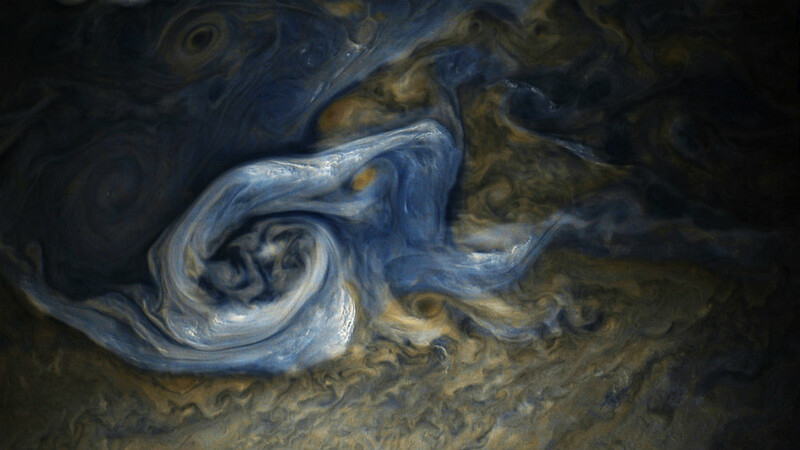 Interestingly, when examining this storm, the Juno probe detected updrafts containing ammonia ice crystals, so in other words, though the storm is beautiful, it's certainly not friendly. In this series of images, Juno is particularly close to Jupiter, taking photos at a range of 7,595 miles up to 14,234 miles from the tops of the clouds. Yet, despite being so close to the planet, Juno's camera was still able to capture a wide field of view. 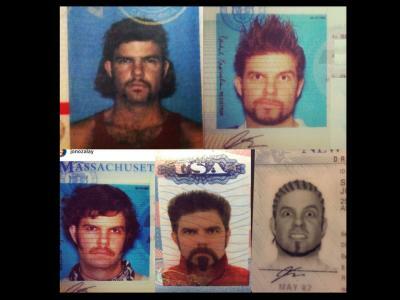 In the last image on the right, you can see the planet's south pole beginning to come into view. The Juno probe's camera, called JunoCam, doesn't just take photos for the purposes of science. 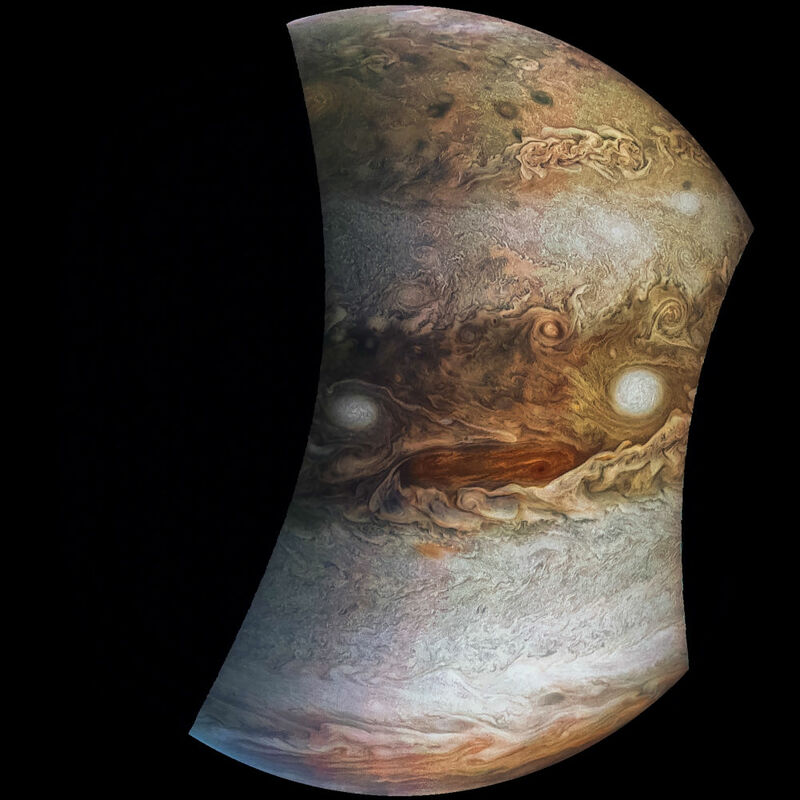 In this shot, Jason Major, a citizen scientist, transformed the original image to create a view of what he dubbed "Jovey McJupiterface." He rotated the image 180-degrees to orient it from the south upward, and by doing so, the two giant white storms become eyes and the elongated red spot becomes a mouth. 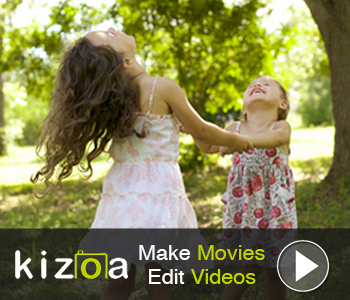 Editor's Creative Tip: Turn your own photos into works of art. Find out how by clicking here. Here, we see a giant storm near Jupiter's north pole. Featured in the image is an anticyclonic oval called the North North Temperate Little Red Spot 1 (NN-LRS-1). The storm - which was first discovered in 1993 - is only the third largest on the planet, even though it measures around 3,700 miles in length. Again, the coloration of the image in post-processing makes the planet look more like a fine-art painting than anything else. No collection of images of Jupiter would be complete without featuring its Giant Red Spot. In this photo, the planet is actually turned on its side, with north on the left and south on the right. Needless to say, it's just another breathtaking shot of our solar system's largest planet. To get a better feel for what it would be like to be aboard the Juno probe as it orbits Jupiter, check out the video above. 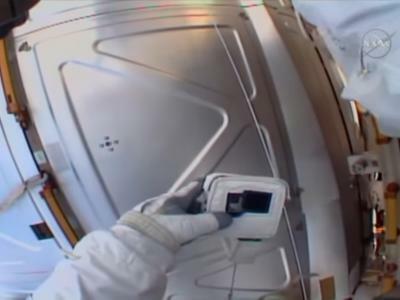 It's a simulation that takes you into the planet's atmosphere at the Great Red Spot and then back out again, and it's certainly worth a couple of minutes of your time! To learn more about the Juno probe, visit NASA's Juno mission page or read our previous article on Juno.